Many factors can have a negative impact on your vision, such as exposure to sunlight, smoking, aging and a family history of conditions like age-related macular degeneration. Of course a healthy balanced diet will benefit your eyes but it is a challenge to eat all the nutrients your eyes need. Modern society is acutely aware of the benefits of supplements to your daily wellbeing. Nutrof Total is a specific eye health supplement designed to help maintain your healthy vision. Nutrof Total is the total formula for eye health and vision. The ingredients in Nutrof Total are continually being updated to reflect the latest scientific findings to help care for your vision. With a unique combination of lutein, zeaxanthin, resveratrol, vitamin D and omega 3. • Complimentary use of the Spa's Thermal Suite - Jacuzzi, steam room and sauna. 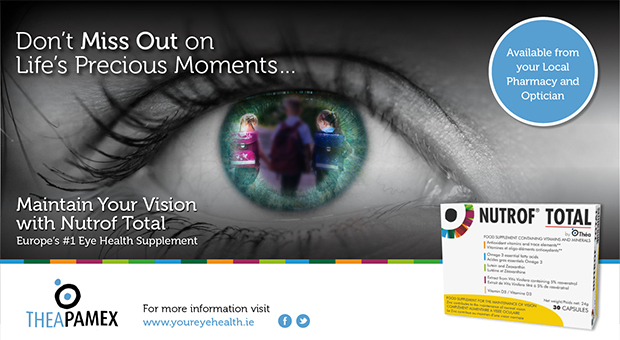 Nutrof Total is available from your local pharmacy without prescription and in selected Opticians. What is Nutrof Total designed to help maintain?